Albert's quote captures perfectly the dichotomous nature of native Butterweed (Packera glabella; syn. Senecio glabellus). On one hand, a sea of yellow flowers carpeting farm fields flanking Ohio's interstates in the spring provides welcome relief from highway monotony. On the other hand, upright 2 – 3' tall plants bolting seemingly out of nowhere in Ohio landscapes presents a weed management challenge. Butterweed is so-named because of its conspicuous buttery yellow flowers. Its alternate common name of Cressleaf Groundsel comes leaves that resemble watercress. The flowers are representative of members of the aster family (Asteraceae). Each flower has a central composite cluster of disc flowers surrounded by up to 15 florets radiating like a star. Indeed, "aster" comes from the Greek name for "star." Vast expanses of yellow, daisy-like butterweed flowers may draw the misplaced ire of allergy sufferers. However, if you're suffering sneezing fits, the answer, my friend, isn't blowin' in the wind. The sticky, large pollen grains are too heavy to be moved by anything other than insects. Butterweed is actually considered to be an important early spring source of nectar for bees and other pollinators. The flowers are borne at the ends of thick, erect, deeply ridged green stems that are sometimes streaked in reddish-purple. Seedheads look like miniature dandelion puff-balls which is no accident; dandelions (Taraxacum spp.) also belong to the aster family. Butterweed is a winter annual meaning that seeds germinate in late summer to early fall. Members of this sneaky group of weeds grow throughout the winter and flower in the spring. Winter annuals aren't much of a problem for farmers who plow in the spring because entire plants are plowed under. However, butterweed growing in hay fields is a different matter. The leaves, stems, flowers, and seeds of butterweed plants contain pyrrolizidine alkaloids that can cause liver damage if consumed by livestock. The resulting chronic disease is called "seneciosis" from the alternate name for the genus. Normally, livestock will avoid eating butterweed; however, they may accidently ingest dried plants if the plants or plant parts are harvested with hay. Winter annuals can become a serious problem for landscape and nursery managers created by an over-dependence on preemergent herbicides applied in the spring to control weeds. Preemergent herbicides used to target the spring seeds of summer annuals (e.g. crabgrass) do not remain effective long enough to suppress winter annual seed germination. 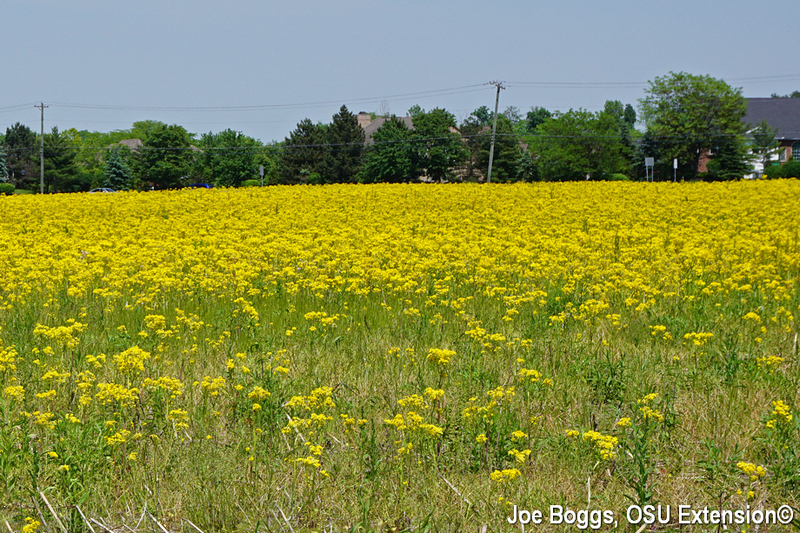 This allows winter annuals such as butterweed escape to reappear as unwelcomed harbingers of spring each year. Of course, if butterweed is misbehaving, this winter annual can be easily removed right now and seed production reduced by hand-pulling or cultivation. "Burn-down" herbicides such as pelargonic acid products (e.g. Sythe) are also effective. However, various reports indicate butterweed may have some tolerance for glyphosate (e.g. Roundup), so high rates are required. Indeed, there is speculation that perhaps the rise of butterweed in recent years has occurred through herbicide-induced "un-natural selection." In other words, one person's weed management program is another person's wild flower proliferation program. Yellow-flowering Garden Yellowrocket (Barbarea vulgaris) is a non-native invasive biennial weed that is also on the rise at this time of the year and may be found mixed with butterweed. Yellowrocket belongs to the mustard family (Brassicaceae), so it is a prolific seed producer. Plants spend the first year in the vegetative stage as tightly clustered rosettes of prostrate leafy stems that are often hard to spot lurking beneath other plants. The weed shows its true colors the second year when it enters the reproductive stage. Abundant clusters of tiny, bright yellow four-petaled flowers borne atop hairless, stout, light green to reddish purple flower stalks appear to "rocket" above 1-2' tall rounded, bushy plants.